Thai filmmaker Apichatpong Weerasethakul’s maiden feature Mysterious Object at Noon (2000) is an instant success. Loosely based on the game Exquisite Corpse, originally conceived by the surrealists, wherein the participants of the game take turns to advance a storyline, Weerasethakul’s film shows us the director and his crew traveling throughout rural and urban Thailand, picking people at random, presenting them with an audio tape that contains the narrative of a story as told by its previous bearers and asking them to further the tale in whatever way they like. The “story” in the film begins with a physically challenged kid, taught at home by a visiting teacher, who notices a strange, round object roll down from his teacher’s skirt one day, which later transforms into a mystic boy with superpowers! Wait till you see what this already bizarre setup mutates into. The “characters”, who narrate the story, almost run the gamut and include a sober tuna fish seller who, she believes, has been “sold” to her uncle, a talky old lady whose cheerfulness seems to conceal a tragedy, a gang of timid teenage mahouts who seem straight out of a Jarmusch movie, a troupe of exuberant traveling players, each of whom would have a quirk or two if probed, a bunch of TV show participants, two deaf and mute girls who seem to be the most excited of the lot and a bevy of primary school kids whose imagination would, literally, leave one speechless. The original Thai title of the film, apparently, translates to “Heavenly Flower in Devils’ Hands”, evidently, calling attention to the film itself. It is undeniably true that what starts as a beautiful emotional drama is unfortunately mutilated and metamorphosed into a tale of fantasy, then, mystery, horror and romance. But, surely, this “heavenly flower” is not of much interest compared to the devils which hold it. Mysterious Object at Noon is, perhaps, closest in style and intent to Abbas Kiarostami’s Homework (1989), in which the director brings down a whole nation sitting in a stuffy room with a bunch of first graders (Actually, Weerasethakul’s whole body of work tempts one to equate him to Kiarostami, especially given his penchant for cars and roads!). Here, as in Homework, the initial objective of the filmmaker, eventually, turns out to be one big MacGuffin. The ultimate point of the movies is not to investigate whether the kids complete their homework promptly or if the story streamlines into a smooth narrative ready for Hollywood, but to draw out a portrait of a society derived from these first hand accounts. Weerasethakul’s movie may be a joke derived out of a simple afternoon game, but what it does, in effect, is to draw the cultural landscape of a country, not by taking a didactic top-down approach but by examining the most basic fears, desires, anxieties and interests of common folk who form its social structure. Essentially, Mysterious Object at Noon examines the function and power of stories as cultural artifacts and explores how stories preserve and reflect the spirit of the age they originate in, much like every art form – major and minor. Additionally, Weerasethakul’s film acknowledges the tendency of these stories to undergo transformation through the years as they pass from one social class, age group, ethnicity and way of life to the other. These stories may get corrupt along the way, may absorb elements from real life and even end up losing their original meaning, but, in any case, they serve to perpetuate culture and build links between generations (One kid in the final segment recites a story about an uncle who recites to his nephew a story about an uncle and a nephew. Presumably, this story was told to him by his uncle). These stories may be passed on in the form of books, paintings, photographs, modern recording media (a la audio tapes, which are used in this film to record the story) and word-of-mouth, as Weerasethakul’s film indicates by turning on and off sounds, images and texts in an incoherent fashion. But, whatever the form, each version of these stories carries an imprint of the narrator’s sensibility and world view. With some effort, from each story, one should be able to reconstruct the realities of the world the narrator lives in and vice versa. Like the image of the railway tracks, which are parallel but seem to be converging at infinity, that punctuates the film, these stories, although appearing to be all over the place on the surface, have one point of convergence – they all help out in sketching the collective consciousness and the collective unconscious of a particular culture at a given point in time. Moreover, by actually making a film out of the concocted story, Weerasethakul concludes that cinema, too, is one such medium that could well function as a sociological document and which the posterity can use to understand their own history from very many perspectives. By merely filming in black and white, Weerasethakul takes his film one step away from reality and makes it seem like an antiquated object that is being preserved for a long time. And like these stories that shape-shift with time, Weerasethakul, call it a running gag, makes certain folk tales and myths repeat themselves across his filmography, albeit in different avatars – another one of his many similarities to Kiarostami. The humourous father-daughter duo, who talk to the doctor about the old man’s hearing problem, reincarnate in the director’s next movie Blissfully Yours (2002). The story about the two greedy farmers and the young monk, which makes an appearance in the hypnotic Tropical Malady (2004), resurfaces with a more violent outcome in Syndromes and a Century (2006). And the tale about the shape-shifting “Witch Tiger” that the young boy begins to narrate at the end of Mysterious Object at Noon forms the entire second half of Tropical Malady, needless to say, in a completely transformed tone. For a writer-director who has consistently soaked his films in the themes of permanence of history and mythology, recycling of human memories and behaviour and the existence of a common binding spirit across generations, this gesture just can’t be considered as a mere prank. Mysterious Object at Noon consistently reinforces and reminds of Weerasethakul’s preoccupation with juxtaposition of cultural extremes. Often in the director’s films, aptly highlighted by the “traveling shots” filmed from the car’s front and rear windows, we find ourselves wondering whether we are going forward in time or backwards. The very first shot of this film presents us everything that would become the director’s trademark in the following years. This single four minute point of view shot from inside a car presents us a host of extremes placed alongside each other. The car starts out on a broad highway, amidst tall buildings of the city, and takes a serpentine route to gradually arrive at a sparse and quieter suburban locale. The vehicle is that of an incense and tuna fish seller. He is broadcasting an advertisement using loudspeakers attached to the car, endorsing his brand of incense sticks, citing its virtues, and asking people to use only this brand while worshiping Buddha. This blatant lie on the soundtrack counterpoints the truth of the photographic image, which is also much more banal and undramatic compared to the fictional stories we hear on the car radio. Furthermore, by using an advertisement marked by scientific terminologies and latest capitalistic strategies to endorse a product used in a religious ritual, Weerasethakul brings total modernity and total antiquity – the future and the past – together to provide a broad outline of a country in transition (Tokens of American influence on contemporary Thai culture are abound in Weerasethakul’s films). Later, the director goes on to further explore the volatile boundary between reality and fiction and the object-mirror image relationship that they share with each other – using both the film within the film and its making-of. As it turns out in Panahi’s The Mirror (1997), reality deviates as significantly from fiction as it resembles it (The mystic kid seems, in actuality, far from being mystical and is more interested in KFC and comics). Weerasethakul prefers to be called a conceptual artist rather than a film director (He cites Andy Warhol as a major inspiration). This tendency of his is most manifest in Mysterious Object at Noon, wherein he is content is merely triggering a chain of events and persevering to see what evolves. There is no manipulation of the mise en scène, the plasticity of the image is never harnessed and the camera is employed at a purely functional level. Weerasethakul does not even polish the gathered fragments and simply joins them, leaving all the interpretation to us. Shot in digital, cinéma vérité style, using handheld, and no predetermined script, Mysterious Object at Noon oozes with documentary realism. Like he does in most of his films, Weerasethakul keeps exposing the tools of his trade in an attempt to disillusion us from the belief of watching an alternate reality and to reinforce the fact that this movie indeed takes place in our world. At one point in the film, the director himself enters the frame to adjust the lighting for the film within the film he is shooting. As a result, he lets us see both the creation and the creator – the image and the process behind its construction – much like he does with his script and its authors in Mysterious Object at Noon. However, Weerasethakul’s self-reflexive moves do not end here. The film’s title should, appropriately, be cleaved into “Mysterious Object” and “At Noon”. 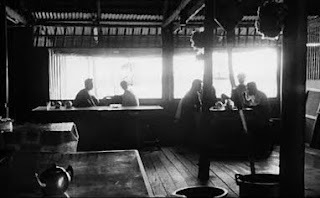 Weerasethakul, after presenting us the major part of film dealing with the “mysterious object”, adds an epilogue titled “At Noon” shot in the director’s hometown of Panyi, whose quiet nighttime images we are already acquainted with thanks to the director’s earlier film Thirdworld (1998). This one is a completely freewheeling, heavenly segment in which we witness a group of boys playing soccer in the afternoon, kicking the ball into a nearby pond and taking a bath in the process of retrieving it. This is followed by vignettes of people having lunch and a bunch of younger kids, before being called by their mother for lunch, tying an empty tin can to a dog’s neck and watching the poor animal go berserk due to the noise the can produces. They say that the essence of life lies in boredom. Likewise, Weerasethakul seems to be of the opinion that the most interesting things in life arise out of these dead times in the afternoon (one needs to just look at the director’s next film for proof). And like these kids who seem conjure up fascinating things from the most commonplace of objects, Weerasethakul, too, realizes a movie completely out of the “dead time” of his characters’ lives, creating something magical that only cinema could have brought to life. In a way, Mysterious Object at Noon is an elegy for the stretches of time we've lost in planning ahead, the times we've cast off in the pursuit of “higher” goals and the dead times we've killed in order to move into lifeless ones.